The FTSE 100 closed today's session (April 4th) with a 1.2% loss and more or less on its low for the day. 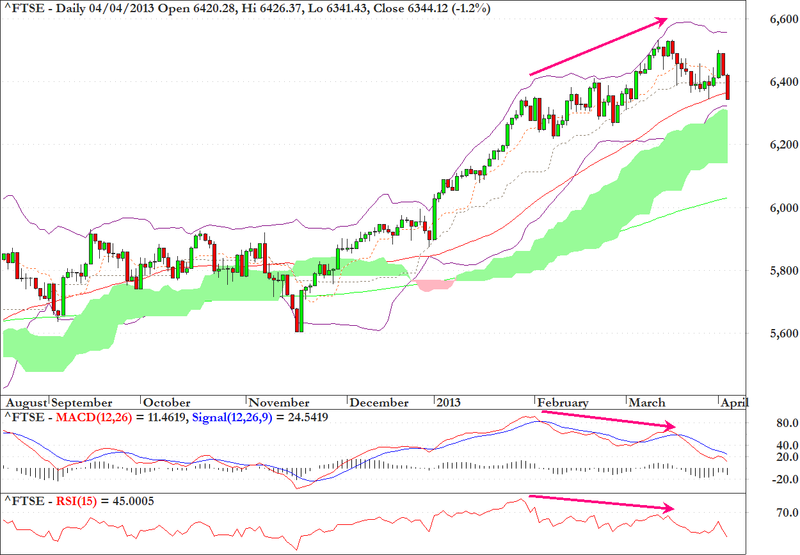 The daily chart reveals two archetypal negative divergences as revealed in the bottom two segments of the graphic. While price continued its climb throughout February, the arrows on both the MACD and RSI chart were sloping downwards indicating a lack of momentum and conviction behind the move to highs not seen since 2007. 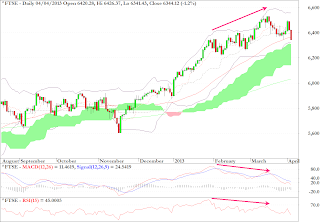 Today's close violated the 50 day EMA (red line on chart) and while there is evidence of support around 6300 from the top of the cloud formation and the lower BB band, a feasible medium target would be an eventual test of the base of the cloud in the vicinity of 6140.